The books refer to this plant as 'very variable' and my heart sinks. I have tried to make the identification process as thorough as possible and I can put my hand on my heart and say – I'm pretty sure my photographs are of Common Mouse Ear. However, if I'm wrong, please let me know. 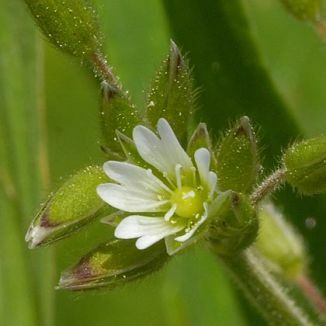 Common Mouse Ear is a hairy perennial, frequently found in gardens, roadsides and disturbed ground and flowers from April to November. 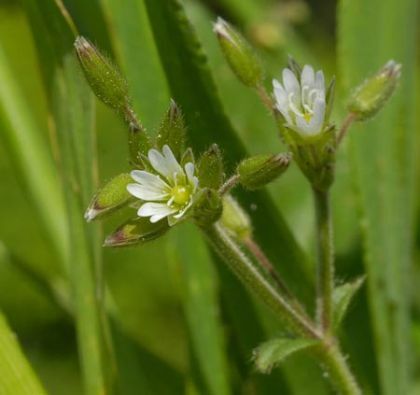 Its small white flowers (5-7mm) have five deeply notched petals and sepals of equal length. Its grey-green, sessile, lanceolate leaves are arranged along the stems in opposite pairs. This little native plant is abundant throughout Ireland and belongs to the family Caryophyllaceae. I first identified this plant in Athy, Co Kildare in 2004 and photographed it there and in Glenmalure, Co Wicklow in 2005.